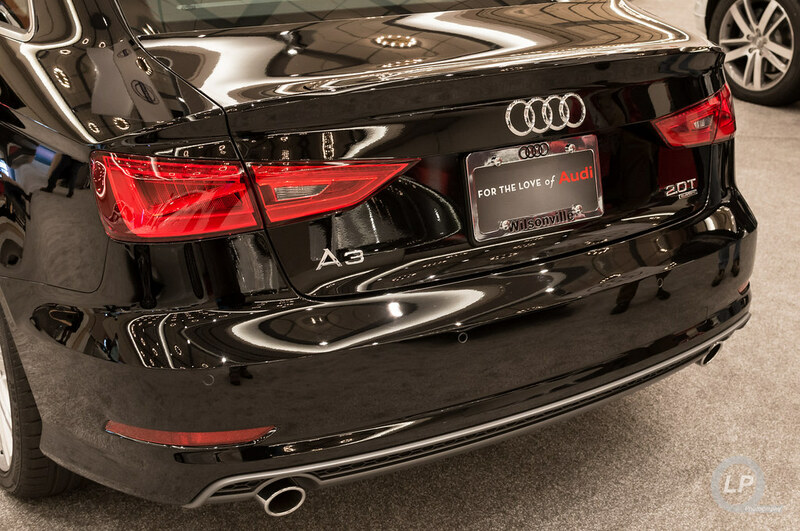 Once I heard that the new Audi A3 Sedan would be at the 2014 Portland International Auto Show, I knew I had to head over and check it out in person. Before I go into my impressions of the Audi A3 Sedan, I had to deal with entering the auto show. I had bought a ticket through the auto show’s website and used the option to add the ticket to Passbook on my iPhone. Although, that should have made things more convenient, it ended up causing entering the show to be a pain. I got to the show right before they let people in on Saturday morning, but their barcode scanners did not handle the 2D/QR barcode that Passbook used. So, I had to bring up the receipt that I got in e-mail and provided them with the confirmation code. Upon entering the auto show, I made several stops before heading to the Audi display, including the BMW i3 drive (well, they had someone drive and I was in the passenger seat). The BMW i3 itself looked a lot better on the inside and had a lot of headroom and did not feel like a compact car. The new A3 Sedan definitely has a bit of the B5 A4 proportions to it and has the current Audi design language worked into every nook and cranny. Due to the new A3’s use of the MQB platform and the transverse engine layout, there is a wee bit more front overhang than the current MLB-based B8/B8.5 A3; but, that actually mimics the longer overhang of the B5-B7 A4. 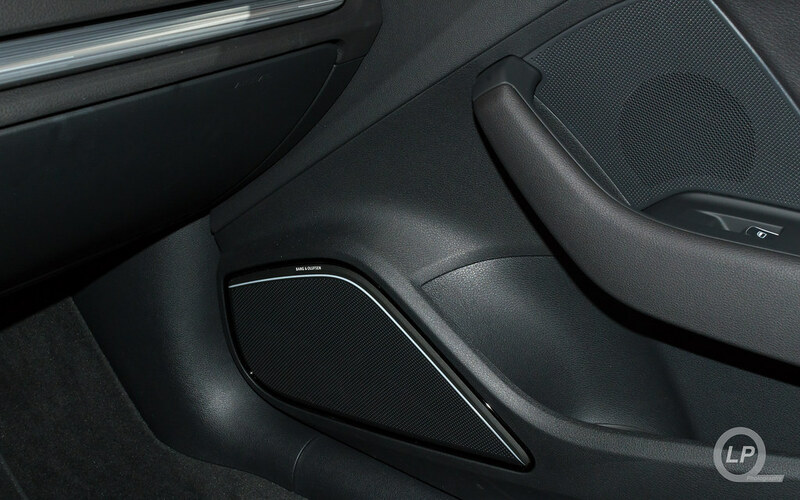 On the inside, the new A3 Sedan carries over the round HVAC dash outlets that have been used on the previous A3 Sportback and the Audi TT; but, the rest of the interior has been re-done and upgraded considerably. The previous A3 Sportback’s interior didn’t quite come up to the same quality and materials that Audi fans have come accustomed to from the B6 and B7 A4 or the C5 A6. The new A3 Sedan’s interior is now to the same level as the B8 A4 (and surpasses it in several small areas). First up is the pop-up MMI display that doesn’t stick out like a sore thumb compared to the Mercedes-Benz CLA COMAND display. The controls for the MMI system is located behind the gear selector, similar to the layout in the A4/A5. 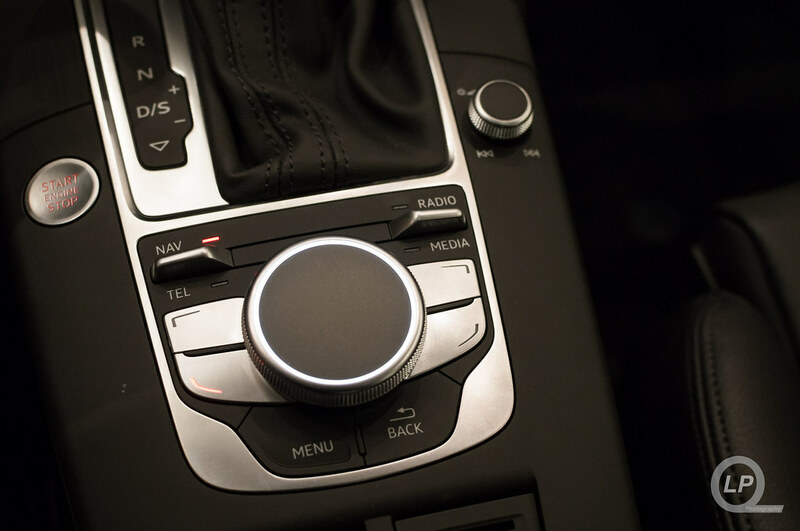 The traditional MMI knob and the dedicated MMI touch pad found in the A6, A7 and A8 have both been combined into one knob with a matte, touch-sensitive surfaced knob. I found that the character recognition to be a bit better in the A3 than in the other implementations of the MMI Touch. Another, welcome, departure from the MMI controls found in the previous A3 and in the A4/A5 MMI setup is the continual simplification of the buttons used to navigate the various MMI features. For instance, two toggle switches replace various buttons to get access to the Navigation, Radio, Media and Telephone functions. The four corner buttons still surround the MMI knob and the two Menu and Back buttons are now closer to the knob. The volume knob also provides access to the skip forward and backward functions as in the B8.5 A4/A5 MMI Navigation plus systems. The button layout for the MMI and driver information display on the steering wheel are very similar to controls on the A6, A7 and A8. 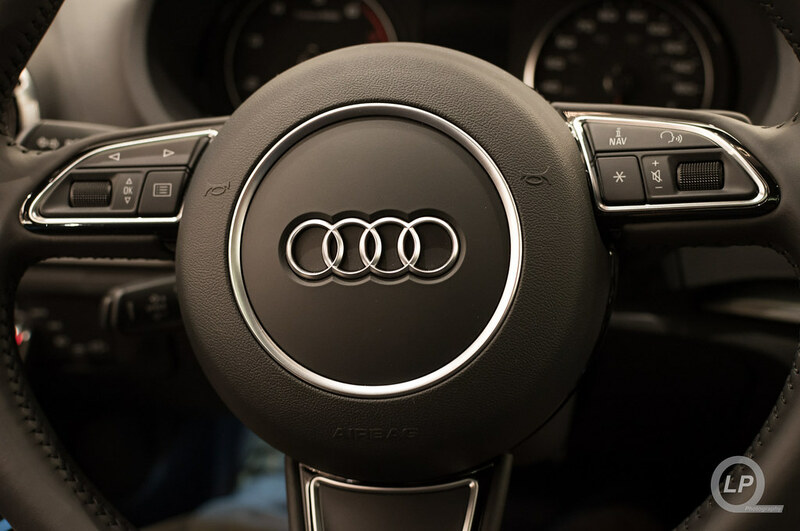 I still think Audi should start using larger flappy paddles on their steering wheels and at least trim them out with Aluminium, akin to those found in the S and RS lineup. 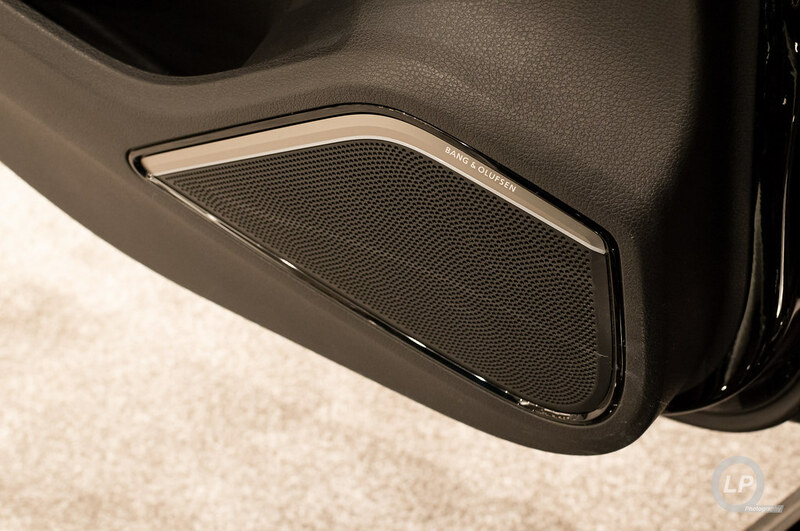 The A3 Sedan on display had the Bang & Olufsen speaker package, which includes accent lighting that is also found on the MMI knob and on the inside of the cup holders. 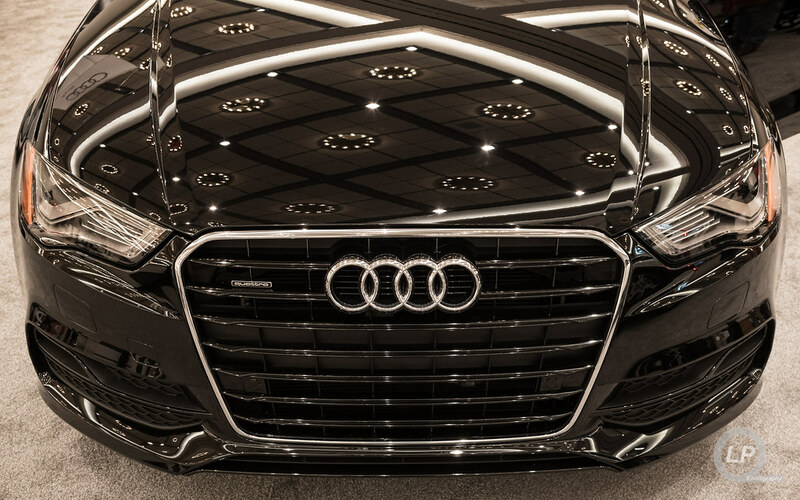 The accent lights had a nice combination to the ambient lighting that Audi has continued to integrate into all of their models. 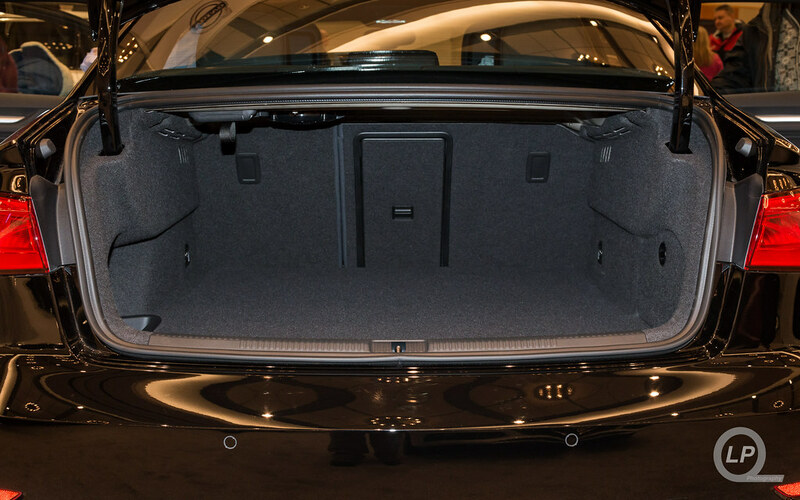 The trunk space of the A3 is quite spacious for a compact vehicle and folding down the rear seats (60/40 split) and the passthrough for skis make it pretty darn usable. Does it provide the same level as utility as the A3 Sportback? Probably not. On the topic of the rear seats, I was just able to squeeze my mini-Bibendum sized body into the rear seat. Unfortunately, the slightly aggressive rake cuts down on the rear headroom a bit too much for me. Granted, the likelihood of me being in the rear seat of an A3 is low; but, it is something to consider if you are going to be hauling taller passengers. That said, the rear seats and headroom seems to feel a bit less-claustrophobic as the Mercedes-Benz CLA. 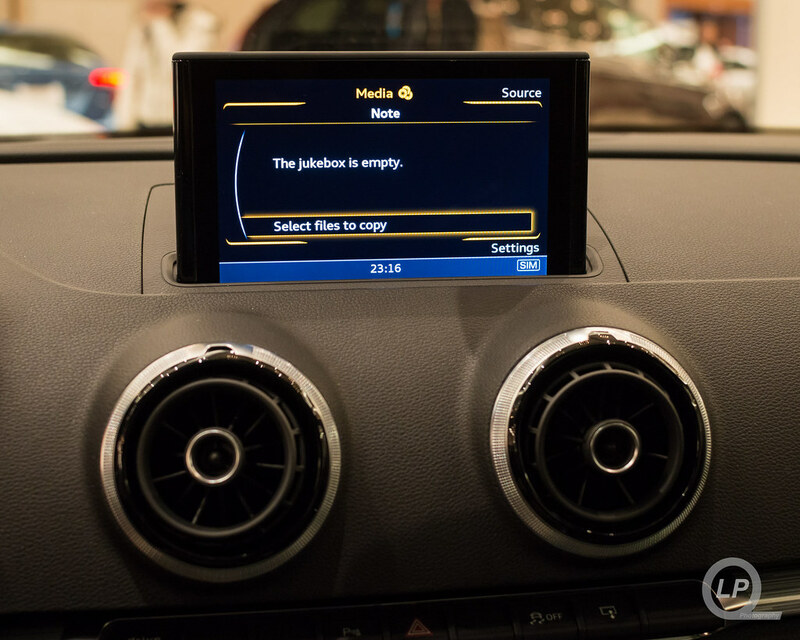 The CLA seems to compromise usability and utility for style, which works for some people. For me, I rate usability and utility a bit higher than styling when it comes to sedans and hatchbacks. As much as I miss the A3 Sportback, the new A3 Sedan stands to be quite popular in the US market and fills in the spot left when the A4 grew in size for the B8 generation. I really want to take an A3 Sedan out on a short-term test to see how its handling, dynamics, the new 2.0TFSI and the S Tronic dual-clutch gearbox add to the experience. Additional photos from the Portland Auto Show can be found in the “08 Feb 2014 Portland International Auto Show” set on Flickr. Thanks Linh – great write-up and pics. Glad you liked the write-up and photos. Cheers! I am pretty sure the engine is transverse (like other MQB cars). Looking at pictures of the A3 sedan engine’s bay seems to confirm this.I would have been surprised otherwise since I think all Haldex setups are transverse. Yep, it is in fact transverse-mounted. What I was referring to is that the proportions of the MQB seem to nearly match the longish overhangs of the pre-MLB longitudinal layout in the B5-B7 A4 family. In those, the engine really stuck out in front of the front half-axles and required a longer front overhang that isn’t that far off from what you would find in a traditional FWD setup. The MLB platform helped reduce that overhang a bit, and therefore changed the overall proportions accordingly. I really like the new model. Looking forward to the S3, too. Thanks for the report! I like the size & the looks of the car, but Audi has made the car as uninteresting as possible to me – no TDI, no Sportback, and above all no manual transmission. The A3 TDI will be coming later in the year and Sportback will be relegated to the e-tron plug-in hybrid. The lack of a manual transmission is the biggest downer for me, that’s for sure.